The white Miniature Schnauzer is regarded as something of a rarity, but is becoming increasingly popular. 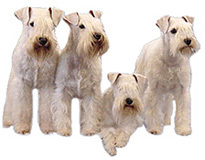 The white Schnauzer is virtually always a Miniature - there are almost no white Giants or Standards. They are NOT albinos. Technically speaking, they are Schnauzers which carry the double recessive e/e gene. It's also not true that Miniature Schnauzers were bred with Westies to create the white color. As anyone who has ever scraped a white car or tried to touch up some white paint will realise, there are many different shsdes of white... and Miniature Schnauzers are no different! A no color is a dog with a pure white coat. Born with pink pads, lips and noses which later turn the base color. (The base color is the natural color of the nose and paw pads). A white chocolate is also called a brown-nosed white. This is genetically the same coat is the black-nosed white, only the base color is brown, not black. False white, wheaten and platinum silver are all variations of white Schnauzers. False whites are born a tan color, but lighten white when fully grown. Wheaten are more yellowy white (with a brown base color) and platinum are more silver-colored (with a black base color). Miniature Schnauzers were first created by “breeding down” - or reducing the size - of the Standard Schnauzer. This was done by German breeders who crossbred the Standard with various other breeds of dog, such as the Affenpinscher. The breeders wanted to produce a smaller version of the Standard Schnauzer in every way - same appearance, temperament and color. The Standard Schnauzer only has 2 colors, salt & pepper and the less common black. At that time -the late 1800's - breeders had far less understanding of genetics. By crossing the Standard with different colored dogs, they actually produced Miniature Schnauzers in a 3rd color - black and silver. These were originally classed as salt and pepper! Breeders then realized that the black & silver color bred 'true' when both parents had this color. By then it was too late to unregister all black and silver dogs, so this 3rd color was created and accepted. The same universal acceptance has not, however, been given to whites. Early German breed records record a "gelb" (German for yellow) color. This was introduced into the breed through German black champion Miniature Schnauzer Peter V Westerberg, born in 1902. Two years later, Mucki gave birth to German Champion Peterle VD Werneburg. Almost every Miniature Schnauzer line researched in AKC records can be traced back to Peterle or his grandfather Peter V Wersterberg. It's often said that gelb meant white , but there is no definite proof of this. But when hand stripped, most white Miniature Schnauzers with the proper wiry coats have a yellowish streak on their backs and heads. It's thought this is why they were originally called "yellow" in German records. 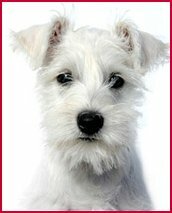 Even though White Schnauzers may have AKC papers - if both of their parents are registered - they are not accepted in shows under AKC or AMSC (American Miniature Schnauzer Club) rules. They CAN compete in other events such as Agility, Canine Good Citizen, Obedience and Earthdog trials. 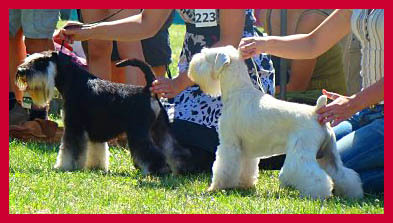 A white Schnauzer can also be shown in rare breed classes organized by the IABCA (International All Breed Canine Association). In fact there are some highly successful white champions from these events. 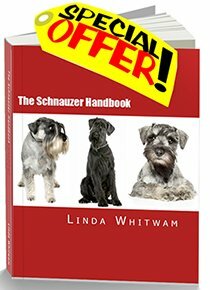 The topic of different Schnauzer colors - and in particular white - is controversial in the Schnauzer world. The breeders of whites claim that white Schnauzers occur naturally - like black and silver Schnauzers - and therefore should be fully accepted. The White Miniature Schnauzer Initiative was established in 2006 in Germany for worldwide friends and breeders of Whites. Their aim is to provide a network for sharing ideas and information and to give breeders the opportunity expand the gene pool of the white Miniature Schnauzers internationally. There is some talk of a similar organization being formed in the US, but nothing has come of it so far. Breed societies and the AKC disallow the whites as they claim the white Miniature Schnauzer does not conform to the 'ideal breed standard'. A further point they raise is that some whites are bred in 'puppy mills' set up by unscrupulous breeders to cash in on the rarity factor - and high prices - of White Schnauzers. Head over to our page on Schnauzer Colors – the Great Debate to read both sides of the discussion on more detail. If you do decide to get a white Miniature Schnauzer, you may not be able to show him in major shows, but that doesn't mean he won't make a fantastic pet. The main problem with puppy mills is that they produce puppies of poor genetic stock. This often leads to health and temperament problems causing much heartache later on for the unsuspecting family who bought the Schnauzer puppy in good faith.